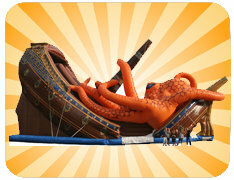 The Kraken Slide will be the hit at your event! This beautiful 28' tall dual lane inflatable slide is great for large events that want to have a unique and exciting giant inflatable slide that will attract an audience. Riders will experience the thrill and excitement of escaping the ship as it is being devoured by the infamous sea beast, the Kraken. Kids must be 42" tall to slide on the Kraken! The slide requires 3 blowers with three different 15 amp circuits. Generators are available for rental when power is not available. The base rate is for up to 4 hours. Each additional hours is $30.00. Delivery is free within 15 miles of our location, each way. Each additional mile is 75 cents a mile each way. The Kraken Slide is 28' tall x 46' long x 16' wide and needs a space 20' wide by 50' long by 29' high. This is a very large inflatable that can not be moved up hills, up and down stairs, or through small areas. Our trucks MUST be able to drive to the set up area!